There’s a lot to commend a recently released report from the Commonwealth Fund that presents a concise, well-written, and comprehensible overview of the market meltdown and its impact on private foundation giving. 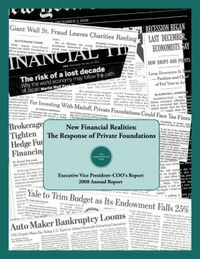 Anyone looking for a good primer of what went wrong and how the crash will affect foundation operations and giving going forward will find the New Financial Realities: The Response of Private Foundations a good read. –Sustained increases in the U.S. money supply. –Enormous credit expansion and indebtedness throughout the nation and world. –Reluctance by the Federal Reserve to do anything to pierce the growing bubble. Craig predicts that when the final tally is done, foundation losses between 2007 and 2008 will total $167 billion, or a 25 percent drop. A hat tip for a thoughtful analysis, jargon-free discussion, and helpful context for how foundations are likely to fare in these uncertain times.